When I was boy, I thought Mike Cuellar’s last name was pronounced KEW-ler. It’s actually pronounced KWAY-ar, I think. But the point is, I sort of miss Mike “KEW-ler” Cuellar. I think of him as a separate entity from the actual Mike “KWAY-ar” Cuellar, but though the latter lives on (in both actuality and in the record books), the former lives on nowhere except in the large graveyard in my mind set aside for mistakes and misperceptions. The mispronounced Mike Cuellar was both more mysterious and closer to me than his successor, and his departure was part of a general trend in life toward distance and the dwindling of mystery. 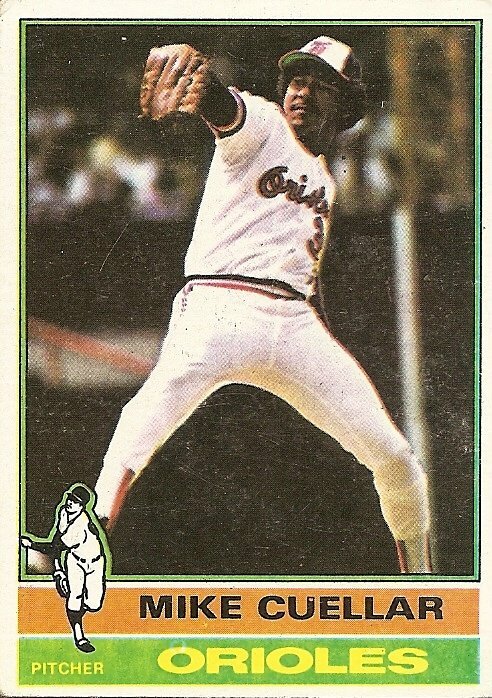 Other baseball card names I mangled included Miguel Dilone (I pronounced it mi-GWELL di-LOAN), Rogelio Moret (Rah-JEE-leo ma-RETT), and Diego Segui (DAY-go seh-GWEE). I wasn’t so clear on Bruce Bochte, either. Was it BOCK-tee or BOTCH-tee? I didn’t know. Even one of the few names I knew beyond doubt how to pronounce aloud, and that I had in fact shouted until my throat was raw with thousands of others in his presence, became strange and complicated on his baseball card: Yastrzemski. And to this day I’m unclear on Sid Monge. Is it Monj? Mong? Mon-jay? Monjy? Mon-hay? Mongy? Mon-gay? Though I worry that some day some preposterous situation will arise that will require me to correctly pronounce Sid Monge, my confusion over which of the above options is correct strikes me as a rare surviving species from the world of my childhood. So if you know how to pronounce Sid Monge, don’t tell me. I don’t want to know. 1. Sid Monge pitched for the Angels when I was a kid. 2. My mispronounciation was Jeff Bur-RUG-o-hiss, who shared the 74 MVP card with Steve Garvey. How could he be the MVP when I never heard his name? And of course, the guys who actually end in an -AY, we mispronounce the other way. Of course, its a lot of fun, but it seems rather childish now that we’ve all crossed the 40 threshold, or are rapidly getting there. 4. I can pronounce Monge and the Spanish names didn’t really confuse me. It’s the old names that confused me, like Nap Lajoie. This has nothing to do with anything else, but I always liked the name Mark Lemongello. I thought that he was some sort of dessert. 5. 3 – Yeah, I do that with Andre “Ay-tee-yay” Ethier. 6. What’s amazing about this post is how true it is for me. I can’t think of them right now, but I’m sure I had no idea how to correctly pronounce dozens of baseball players’ names whose baseball cards I still may have. Both youth and ignorance combined to imaginative prononciations. 5 At least I’ve heard an interview with Ethier who explained that “Ay-tee-yay” was, in fact, the French way to pronounce his name, which, ancestrally, is French. 3 I have a co-worker whose name ends in -ier, and she pronounces it “ee-eh-r”, but in my mind, it is “ee-ay”. And now, I guess it is the Yankee-fan’s problem on how to pronounce Wilson Betemit’s last name. I’ve heard some say that he wishes it to be pronounced “Bey-tah-MEE”. Oiy. Good luck with that. 7. I was in high school in Indiana when Eric Montross was one of the state HS basketball stars. Whenever his name came up, I mumbled the second syllable of his last name because I didn’t know if the o was long or short. I was secretly happy that he never became a big NBA star. 8. In light of this discussion, allow me to send out a happy Red Sox fan welcome to their newest member, Eric Gagne. Surely he pronounces his name the same as former Twins shortstop (and Massachusetts native) Greg Gagne: GAG-nee. 9. … Hey, I thought it was pronounced KWELLER. 10. The funny thing about Greg Gagne is that he is one of the few guys who is subject to retroactive mispronunciation, thanks to Mr. New Red Sox Closer. Although I called him Greg GAGG-nee when he was active, nowadays the name always seems to come out of my mouth as Greg GAHN-yay. 11. Manny “Sangwillen” Sanguillen and Manny Trillo (I said it like it’s spelled rather than Tree-O) were a couple of my favorites. Celtics fans referred to Eric Montross as Eric Monstrosity. I went to elementary school with a kid who’s last name was Guillen. Everybody called him Gull-yen until Ozzie Guillen became famous. I don’t remember him correcting anybody either way. 13. As a child, I read much more than I ever spoke to other people. My family, to this day, mocks me soundly by repeating my lonely, idiosyncratic first pronunciation of m-ON-ks, ALL-bany, and Ig-nah-tee-us (St. Ignatius). When I finally got a Stratomatic team of my own, in my early 20s, I pored over my cards with glee and deep trepidation. At my women’s college I had had precious little chance to speak to anyone about baseball, and I had moments of paralyzing anxiety when first attempting to discuss my Stratomatic team with anyone else in the league. Alas, there was no email then, so I actually had to vocalize names such as, yes, Greg GAG-nee. Thank god for Fernando Valenzuela. 14. I could never see Jaime Cocanower’s name without inserting “cocaine” into it. To this day I have no idea how it’s pronounced … I just think of him (on the rare occasions I think of him) as Jaime Cocaine. 15. As a lifelong Mets / National League fan, I wasn’t up on my American League when I was a kid, except for the Orioles, because one of my school friends got me into them. I think I was actually okay with the pronunciation of Cuellar. I still haven’t figured out whether it was John Lowen-steen or John Lowen-stine, though, one of my favorite players of the time. As far as the current Mets go, Chris McKendry of SportsCenter recently pronounced Ruben as Go-tay and Go-tie during the same segment. 16. My son just cracked himself up by trying to pronounce Dante Bichette. I’ll leave it to you to guess why–he’s ten years old. 17. As a kid I always had trouble with Don Aase. The Double A thing really messed with my head. I was also confused by Rusty Kuntz. I just couldn’t figure out how to pronounce his name (Coontz? )and as I got older it was fairly obvious why my older brother and his friends would all laugh when I would say his name. 18. As a Los Angeles native, the Spanish language names rarely caused me difficulty, although Curt Gowdy’s sometimes odd attempts on the Game of the Week were confusing to me. I can still hear him announcing “Marty MART-in-ez”, for example. The one name that did elude me for a short while, which I pronounced as an English word despite the obvious cue from the first name, was José Pagan. It ain’t PAY-gun baby, it’s Pa-GONE. And rest in peace Mr. Cuellar. Your peak was just before my time, but from every indication you were a key part of the unbelievable pitching staff on a team that belongs in any discussion of the best ballclubs in baseball history. This reminds me of watching a Yankee game in the late 80’s or early 90’s.